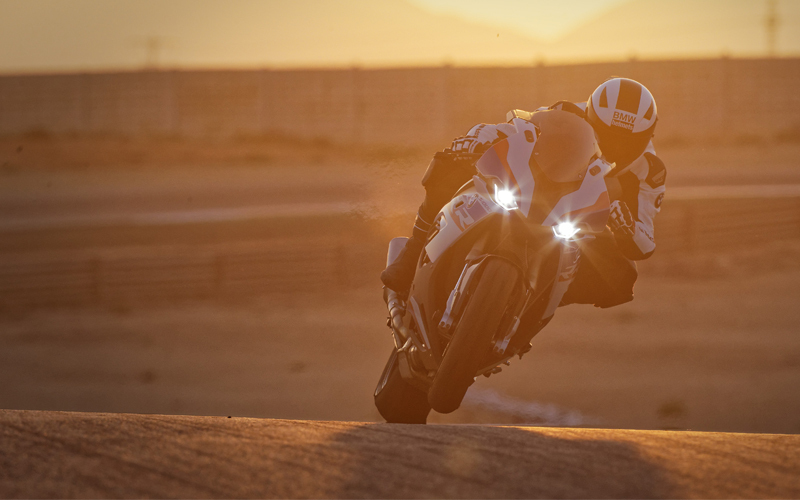 Wings, Water & Wheels - Lighter, Faster & Easier To Control: The New Bmw S 1000 Rr. Recently, the third generation BMW S 1000 RR, the supersport bike originally launched in 2009, made its world debut at EICMA this year. With a completely newly developed engine and suspension, engine output has increased 6 hp to 205 hp (151 kW) and weight has been reduced from 459 lbs to 434 lbs (427 lbs with the new M Package). In addition to enhancing performance, other objectives were to make the new RR at least one second faster than its predecessor, create a more user-friendly design and ensure maximum control and handling. Whether in everyday use, on winding country roads or for high-performance race track riding – the new RR leaves nothing to be desired. Standard assistance systems such as traction and wheelie control, ABS and Hill Start Control as well as the LED lighting system and large TFT screen have reached a whole new level. With its newly developed 4-cylinder in-line engine, now almost 9 lbs lighter than before, the new RR achieves an entirely new level of performance. For this purpose, not only was the geometry of the intake and exhaust ports further optimized, the motorcycle now also comes with BMW ShiftCam Technology – an entirely new technology for BMW motorcycles which varies the valve timings and valve strokes on the intake side. A revised intake passage and a new exhaust system that is almost 3 lbs lighter also contribute to increased overall performance. Rideability and sprint capability benefit from a substantially increased torque across a wide engine speed range. Enhanced suspension geometry for even greater ride precision and further improved handling. BMW Motorrad developers left no stone unturned when refining the bike’s suspension. To achieve significant weight reduction, the engine in the new RR now has more of a load-bearing function than in the previous generation model. The requirement in designing the new main frame, in addition to improving ergonomics, was to have the force applied directly to the engine structure via the shortest possible paths. A significant increase in riding dynamics was achieved in the new RR based on the combination of the new riding geometry, optimized wheel load distribution and a substantial weight optimization. The new Full Floater Pro kinematics in the rear wheel suspension also contributes significantly to the perceptible increase in suspension performance. All in all, riders of the new RR will benefit from further improved handling, increased traction and even more transparent feedback in all riding states up to the threshold range. In short: the new RR noticeably raises the bar on the suspension side while at the same time becoming more user-friendly and controllable. The next generation of the electronic suspension DDC (Dynamic Damping Control) is also available for the new RR as an option. Specially developed for the RR, Dynamic Damping Control (DDC) requires no compromises in terms of suspension set-up. This is largely made by possible by new valve and control technology. Additionally, a shim package is available for selective adaptation when required for ambitious race track riding. For ideal adaptation to varied road conditions, the new RR is fitted with four standard ride modes: “Rain”, “Road”, “Dynamic” and “Race”. For those who wish to delve deeper into the world of race tracks and motor racing, the “Ride Modes Pro” option offers three additional ride modes (Race Pro 1-3) that are freely programmable. These enable individual adaptation of the most diverse control functions such as Dynamic Traction Control (DTC), ABS and wheelie detection as well as the throttle curve (torque adjustment) and Engine Brake to suit the rider’s own skill level and riding style. Other features that come with the “ Ride Modes Pro” option are Launch Control for perfect race starts and the configurable Pit Lane Limiter for exact adherence to speeds in the pit lane. Ultra-fast shifting up and down without the clutch is enabled by HP Shift Assist Pro, which comes as a standard feature. New 6-axis sensor cluster for an unprecedented level of control quality. Dynamic Traction Control (DTC) and DTC Wheelie Function. ABS Pro for increased safety when braking while banking and cornering. The new RR is fitted with cornering-optimized ABS Pro and Dynamic Traction Control (DTC) as standard features. In addition to traction control, DTC also includes a standard DTC Wheelie Function– which can be enhanced with the Ride Modes Pro option to make it individually adjustable for the first time. All control systems have been readjusted for regulation quality and characteristics. 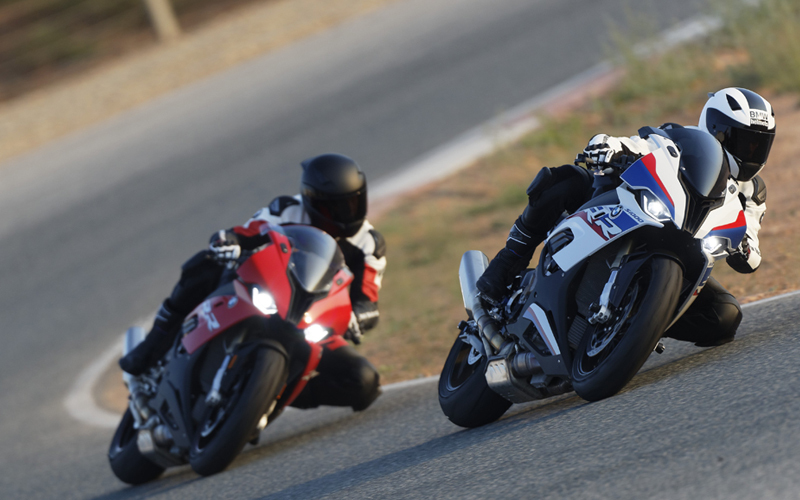 While the partially integral BMW Motorrad ABS systems already provide a very high degree of performance and safety when braking in a straight line, ABS Pro now takes this a step further to offer increased safety when cornering and braking in banked position. Multifunctional instrument panel with 6.5-inch TFT screen for excellent clarity and a maximum range of information. The instrument panel of the new RR has also been completely redeveloped and is now designed even more effectively for use in supersport racing. In addition to a maximum range of information, the BMW Motorrad developers paid particular attention to ensuring that the 6.5-inch TFT screen provides excellent clarity – even in difficult light conditions. The aim was to offer the rider individually tailored screen displays for different uses. The Pure Ride screen shows all the information required for regular road use while the three Core screens are designed for use on the race track. For example, with the rev counter displayed in analog form (Core 1 and 2) or as a bar chart (Core 3). More dynamic design with ideal ergonomics and attractive color schemes. The new layout of the main frame – as a Flex Frame – has made it possible to create a leaner fuel tank and seating area trim sections for improved support and knee grip. Optimized contact surfaces and a newly defined ergonomic triangle between the handlebar ends, seat surface and footrests enhance ergonomics. Meanwhile, completely newly developed body features ensure that the new RR is instantly recognizable as a new model. This is supported by the dynamic design featuring a color scheme with two individual characters: Racing Red or Motorsport paint finish. •The newly developed 4-cylinder in-line engine is 8.8 lbs lighter and has been improved with BMW ShiftCam Technology for variation of valve timings and valve strokes on the intake side. •Increased output and torque: 151 kW (205 hp) at 13,000 rpm and 113 Nm (83 lb-ft) at 11,000 rpm. •At least 100 Nm (81 lb-ft) of torque from 5,500 to 14,500 rpm. •Effort-saving, linear torque curve: further improves handling and control due to increased torque in the lower and medium engine speed range. •Newly developed suspension featuring Flex Frame, with the engine taking on more of a load-bearing function. •Significantly improved ergonomics due to the Flex Frame. •Refined suspension geometry for further improved handling, increased traction and crystal-clear feedback in the threshold range. •Further developed electronic damping adaptation Dynamic Damping Control DDC with new valve generation as an optional equipment item. •New rear wheel suspension weighing 10.5 oz less than before with Full Floater Pro kinematics. •Weight reduction of 25 – 32 lbs (434 lbs when fully fueled (DIN unladen) and 427 lbs with M Package when fully fueled). •New exhaust system weighing 2.9 lbs less, with front silencer. •Adjustable (+/- shift) DTC Wheelie Function with optional Ride Modes Pro. •Standard ABS Pro for increased safety when braking while cornering or in a banked position. •New ride modes “Rain”, “Road”, “Dynamic” and “Race” as standard and a “Ride Modes Pro” option with three additional configurable modes “Race Pro 1-3” to adapt individual preferences to various riding conditions. •Launch Control for perfect starts comes with the “Ride Modes Pro” option. •Pit Lane Limiter for precise pit lane speeds is also included with the “Ride Modes Pro” option. •Standard Shift Assist Pro for instantaneous up and down shifts without pulling the clutch lever. •Shift pattern can easily be reversed. •Electronic cruise control is available as a factor option. •New instrument panel with 6.5-inch screen offering excellent clarity and featuring a Pure Ride screen as well as three Core screens. •LED light units all around. •Turn indicators with a new self-cancelling “Comfort Indicator” function. •Completely newly designed body elements with even more dynamic styling and optimum aerodynamics. •Two color schemes for the market launch: Racing Red or Motorsport paint. •Extended range of special accessories and factory options. “Our fascinating brief was to take the predecessor model – which has been a dominating force in all disciplines for 10 years – and significantly improve on its performance. This we translated into straightforward targets: one second faster on the track, more than 10 kg lighter and easier to control. These targets were taken as the basis for every decision. The result is a fascinating new motorcycle that exceeds the targets we set ourselves and will once again set the benchmark.” – Claudio De Martino, Vehicle Technology Team Leader. For more information, please visit www.bmwmotorradusa.com.